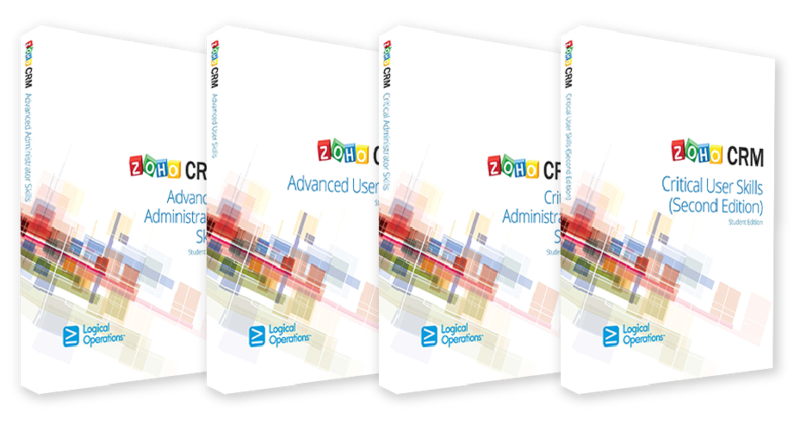 FlexableIT can supply a number of Zoho CRM Training Courseware to either complement an existing course, be the agenda for a particular course or for those that want to learn by themselves. Zoho CRM Training Courseware is available as either: Print, Digital or Print and Digital. For details of pricing and lead times Contact FlexableIT or email: info@flexableit.com. Whether you are a new Zoho CRM system administrator or have been managing Zoho CRM for some time, you should realise that a big part of your job is receiving and acting on requests from management or other Zoho CRM users to modify the system to meet the needs of the users and the company. The nature of Zoho CRM is such that there are usually several ways to accomplish these types of modifications, and you need to know that you are taking the right approach and really providing the support that is needed. By completing this course, you will be able to administer Zoho CRM and enable your users to effectively execute the sales process within your organization. This will help you set up the modules and features of Zoho CRM based on your business requirements. You will also implement the security features of Zoho CRM and enable users to get the maximum benefits out of Zoho CRM by performing data administration tasks and automating sales activities. Finally, you will integrate Zoho CRM with the existing technology in your business by connecting Zoho CRM with your organization’s website and external applications. This course is designed to help Zoho system administrators perform initial implementation of Zoho CRM in an organisation or manage an existing Zoho CRM account of the organisation. The target student for this course is often an existing Sales, Marketing, or Production support employee, an IT administrator who has been additionally assigned the task of Zoho system administration, or an external consultant who has been engaged to provide administrative support for an organisation. To ensure your success in this course, you should possess end-user skills such as creating and managing opportunities, or have basic administrative experience such as setting up or managing the core Zoho CRM modules such as Leads, Accounts, Contacts, and Potentials. You can obtain this level of skills and knowledge by taking the following course: Zoho CRM: Critical User Skills. You will have previously set up Zoho CRM and Users are currently using it to perform sales in various stages of the sales process of your organisation. With changing needs of the users in your organisation, you need to manage the organisation’s Zoho CRM account and configure it to meet the ever growing needs of these Users. By completing this course, you will be able to configure Zoho CRM processes, perform security management for various categories of Users, enable communication tools, create and manage territories, set up sales forecasts, enable Zoho CRM and third party applications to improve lead generation, and initiate advanced analytics to perform sales performance evaluation of your Zoho CRM sales data. Upon successful completion of this course, you will be able to expand and customise a Zoho implementation in a business. This course is designed to help Zoho system administrators perform advanced customisation and system management following the initial implementation of Zoho CRM in an organisation. To ensure your success in this course, you should have practical experience setting up and managing a Zoho CRM implementation. A Customer Relationship Management (CRM) system is most effective in building strong relationships with customers. You can now take advantage of the powerful and user-friendly features of Zoho’s CRM to automate the sales processes within your organization. This course will provide you with the knowledge and skills needed to use Zoho CRM in the real world. You will start using Zoho CRM by familiarizing yourself with the user interface and data components. To support the functioning of the sales process, you will manage inventory data, communication through emails, and repetitive tasks using macros. In addition to these functions, you will perform operations aimed at improving sales and enhancing customer satisfaction by performing marketing activities, customer support functions, and data analysis. In this course, you will use Zoho CRM to improve your marketing, sales, inventory, and customer service business practices. This course is designed for end-users, who may be executives working in sales, marketing, inventory control, or customer support departments, and who may need to use a CRM system as part of their daily work. They may perform tasks such as tracking sales orders, managing leads, and converting leads to closed sales with the objective of increasing the sales of the organization. Students may or may not be familiar with other Customer Relationship Management (CRM) systems and may be new to Zoho CRM. To ensure the learners success in this course, you should have a basic understanding of sales processes and techniques. You should also have basic end-user skills with computers and the Internet, and some experience with using cloud-based applications. This course will provide you with the knowledge and skills needed to use the advanced features of Zoho CRM in the real world. You will use Zoho CRM to improve your individual and team efficiency by designing advanced templates, using autoresponders, creating advanced workflows, collaborating with your colleagues with the Feeds module, and creating forecasts. In addition to these CRM functions, you will learn how integrations with other Zoho products and third-party applications can enhance Zoho CRM. This course is designed for individuals who are experienced Zoho CRM users, who may be executives working in sales or marketing departments. These experienced users want or need to advance their skills in using advanced CRM features to improve efficiency, manage teams, and analyse key CRM metrics. In addition, these users want to develop enhanced functionality gained through integrations with other Zoho products, such as Campaigns, SalesIQ, or Reports, and with third-party applications such as Google AdWords. To ensure your success in this course, you should have practical experience using the sales, marketing, inventory, and customer support features of Zoho CRM. You can obtain this level of skills and knowledge through real-world experience or by taking the course Zoho CRM: Critical User Skills.